Collins Booksellers - 33 Ways: How to Unlock the Mystery of Your Dreams by Judith Doctor, 9780983791799. Buy this book online. Among the many ways God communicates with us, He still uses dreams to give us His divine guidance, instruction, and direction. 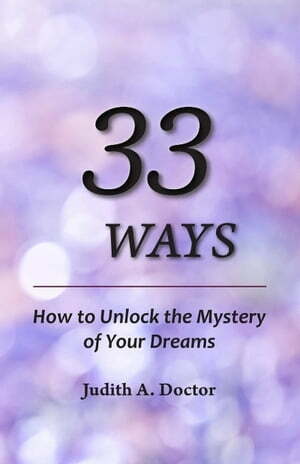 33 Ways: How to Unlock the Mystery of Your Dreams offers ideas on how to work with dreams and discover their hidden meaning. Simple strategies and interpretation approaches help readers understand their dreams and benefit from the wise counsel embedded in them. This book covers basic skills, dream processing methods, meditative & imaginative strategies, and symbolic amplification and association techniques. The dream work tools and ideas described are drawn from many sources—the Bible, Church Fathers, Christian practices, dream research, dream experts, and the author’s wealth of experience. In addition to stories from dreamers through the centuries, the author shares her own (and her husband’s) dreams to illustrate the various methods for approaching dreams. Dreams have greatly influenced Christianity throughout the centuries. Because they contain divine energy, dreams can affect us deeply in every dimension of our lives—empowering, healing, and transforming us. This book simplifies dream work for people who want to understand their dreams, and also provides a resource for healthcare professionals to help others benefit from their dreams.